6-inch organza leaf roll is a whole fabric with bright leaf designs that used to give an elegant look to your projects and accessories. Though, Organza ribbons made from 100% Nylon material available in the size of width: 6 inches and length: 10 yards. At BB Crafts, we offer our organza ribbons in two different colors i.e. 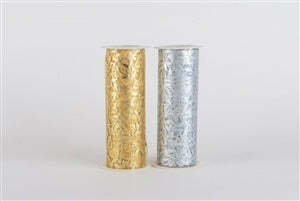 gold and silver, which are used to give a stunning look to your craft projects and decoration. This organza leaf roll considered as the perfect fabric for several occasions such as a wedding, special events, gift wrapping, and much more! It goes beautifully with glitter tulle. Browse all our collection of beautiful organza ribbons, if you want to add creativity to your craft project. Order your products; your satisfaction is 100% Guaranteed. You can easily create different designs with materials organza roll, but for that, you need a strong imagination power and lots of creativity so as to create an atmosphere of luxury and elegance. People use organza ribbon as embellishments for a wedding gown, or invitations and other accessories so as to maintain the theme for the event.